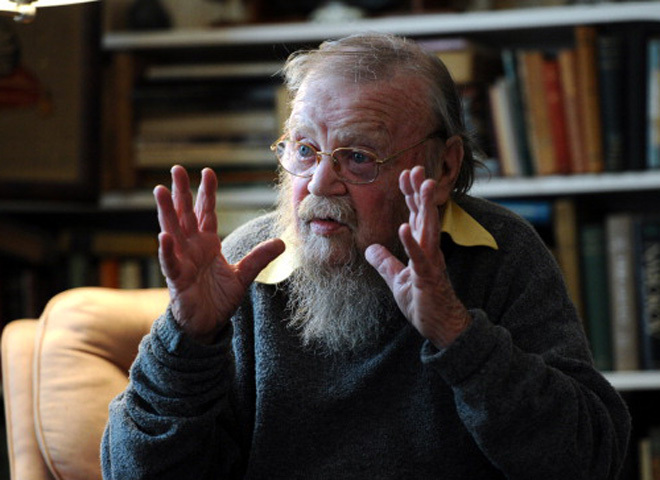 TORONTO - Canadian author Farley Mowat, a master storyteller and tireless defender of nature and wildlife, has died. He was 92. Stephen Smith, a friend of Mowat's, said Wednesday he died Tuesday evening after collapsing at his house in Port Hope, Ontario. There was no word on a cause of death. Mowat wrote some 40 books, many based on his own adventures and travels. Among his best-known works are "Never Cry Wolf," a fictional narrative about Mowat living among wolves in sub-arctic Canada; and "Lost in the Barrens," which follows a Cree Indian boy and a Canadian orphan's adventures in the Arctic. He said he was lucky to be able to combine his two passions: writing and nature, calling the latter "the only subject I really want to write about." Canadian Prime Minister Stephen Harper called Mowat one of Canada's most widely-read authors. "He was a natural storyteller with a real gift for sharing personal anecdotes in a witty and endearing way. His literary works almost always reflected his deep love of nature and of animals," Harper said in a statement. Acclaimed Canadian novelist Margaret Atwood tweeted that Mowat was a "wonderful colleague & friend of many years." From the age of 13, Mowat was fiercely dedicated to writing about the natural world. As a young teen he started a magazine called Nature Lore and had a column in the Saskatoon Star Phoenix. Mowat was born in Belleville, Ontario, on May 12, 1921. The son of a librarian, he grew up in Windsor, Ontario, and Saskatoon, Saskatchewan. His novels and other non-fiction works have been translated into more than 20 languages. Never one to shy away from controversy, Mowat was outspoken about many environmental and social issues. He called Canada's treatment of aboriginals "abominable," said Canada's annual seal hunt was, "perhaps the most atrocious single trespass by human beings against the living world that's taking place today," and said hunts in general were "symbolic of the massive destruction that we've visited upon life." He was awarded the Queen Elizabeth II Jubilee Medal in 1956, the Governor General's Award for "Lost in the Barrens" in 1956, the Leacock Medal for Humor for "The Boat Who Wouldn't Float" in 1970, the Order of Canada in 1981 and a Lifetime Achievement Award from the International Fund for Animal Welfare in 2003. Mowat is survived by his wife Claire and sons David and Robert. Burial plans were not immediately available.